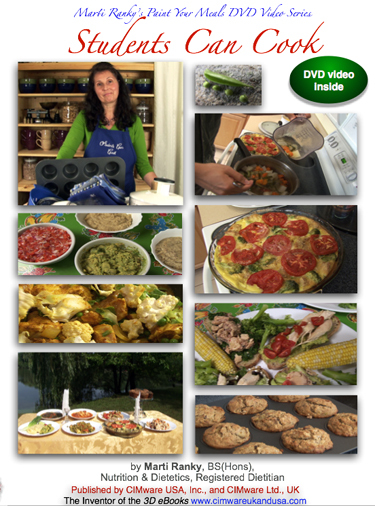 Description: Audience: Enjoy Nutrition is the foundation DVD for the ‘Paint Your Meals’ cooking series. It provides easy understanding of fundamental nutrition principles for audiences of all nutritional background and understanding. 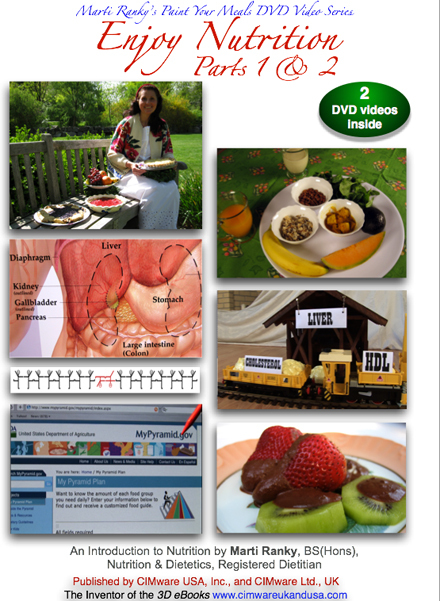 This DVD helps to make informed choices for better food selection, cooking, and lifestyle habits. Entertaining and educational teaching and learning material from middle schools to colleges; as well as adults who want to learn more about the right food choices for themselves and their families. Learning takes on a new meaning here as scientific analysis takes a light-hearted approach with fun practical demonstrations. Description: Audience: One of the best ways to stay healthy, keep off the pounds and meet the demands of studying and exams is to cook and prepare simple and nutritious meals. You can share the experience and definitely the results with your friends. So, forget your worries about cooking, because ‘students can cook’. Contents: While following this 4-step program, an absolute beginner can learn to cook. Plan, purchase, prepare with food safety in mind and you are ready to 'paint your meals', or cook an artistic creation of a nutritious and delicious dish. Get organized, do your shopping, prepare your cooking area, learn about food safety and gradually build up your cooking skills. We start the artistic creation by making 5 herb combinations then using these to make 4 dressings, then salsa, spreads, and pesto. Then we make some great sandwiches. The main dishes will be just as easy to create. We start with the list of kitchen tools you need as well as the ingredients. Then the detailed step-by-step instructions and demonstrations follow. While watching the dishes being prepared, we cook Vegetable Soup with Beans, Quiche, Potato Stew with Paprika, Chicken Curry, Polenta, Brown Rice with Carrots, Chicken Stir-Fry, and Banana-Walnut Muffins. After cooking join us for a picnic in the park. The insert sheet will give you the list of recommended kitchen tools, a generic shopping list, safe cooking temperatures, and a conversion table from imperial to metric units. Marti Ranky, BS(Hons), is a Registered Dietitian in the USA as well as in the United Kingdom / Europe. She was born and grew up in Hungary, Europe and has co-authored several educational Multimedia publications. She received her BS Honors degree in Nutrition from the University of Surrey, UK, and presents lectures and cooking demonstrations of her 'Paint Your Meals' program from her private practice in New Jersey, USA. USA. You can contact her through the publishers: http://www.cimwareukandusa.com, Email: cimware@mac.com She is also the best selling author of the Enjoy Nutrition, DVD Duo program. 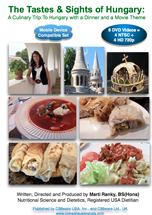 Description: Contents: This is an invitation, to go on a culinary trip to Hungary, Europe. The videos in this 8 DVD box set have 'a Dinner and a Movie' theme. First you can cook a step by step, easy to follow, traditional dinner menu, then watch, as Hungarian history, culture, customs and food, unfold before you. Marti Ranky as a registered dietitian, presents the programs and also shares important nutrition information, and alternatives for allergy sufferers. Over 20 years after the fall of communism, Hungarians can finally claim, and be proud of their several thousand years old knowledge and history, of all that they can share with the world. A great resource and a gift for anyone interested in Hungarian cooking, and/or with a Hungarian ancestry, or who wants to know more about the region’s history and folk art in general. Marti Ranky, BS(Hons), is a Registered Dietitian in the USA. She was born and grew up in Hungary, Europe and has co-authored several educational Multimedia publications. She received her BS Honors degree in Nutrition from the University of Surrey, UK, and presents lectures and cooking demonstrations of her programs from her private practice in New Jersey, USA. You can contact her through the publishers: http://www.cimwareukandusa.com, Email: cimware@mac.com She is also the best selling author of the Enjoy Nutrition, DVD Duo program.